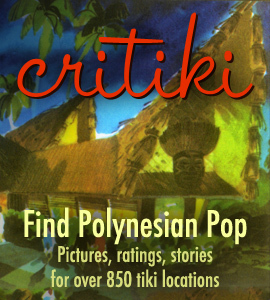 Critiki now has something to help you locate tricky, sneaky, hidden tiki spots: a special gallery of photos showing what the place looks like from the street. This was inspired by my first visit to the Kon Tiki Lounge in Tucson back in 2003 (the pre-GPS days), when I drove back and forth in my rental car, not realizing that its great big famous sign is actually set waaaaay back from the street. Funny thing, though: this is not actually a new feature. The old Critiki Mobile site (which, like, three people knew about and used) had a special Street View gallery for years and years, but the full desktop site never had it. Both sites merged into one much-improved site back in January, but the Street View gallery didn’t make the trip. Now it’s back for good, and for everybody.